“Aren’t those the loveliest eggs you’ve ever seen? Plucked right out of a fairytale! If Humpty Dumpty had offspring, this is what they’d look like!” I exclaimed to my husband. After a year of living in his homeland I still gush over the novel discoveries I make, and he still chuckles at my enthusiasm. At least two-dozen porcelain white, elongated eggs sit in a wicker basket in the glass display case of El Ganso Ibérico, one of the many boutique booths in the Isabela Gourmet Market in Madrid. As promised by Isabel, the vibrant española behind this mercado in the financial district of Madrid, the tortilla de patata de Ganso Ibérico is superb: firm on the outside with a juicy center that overflows with the fresh taste of the Spanish countryside. In this historically rich city that loves to stroll and tapear—go out for tapas—two age-old traditions have merged: appreciation for market shopping and the sanctity of the tapa. This fusion has revolutionized the Tapeo culture and served as the catalyst for the rise of gourmet mercados, inviting environments offering the opportunity to socialize while enjoying high quality food. Three Madrid mercados are situated at the forefront and center of this growing modern tradition of gourmet spaces: El Mercado de San Miguel, Mercado San Antón, and the recently opened Isabela Mercado Gourmet. Though each market has a distinctive personality, a colorful energy fills them all, enticing visitors with the delightful intermingling aromas of hot croquetas, jamón, and fresh seafood tapas and the harmonious buzz of chatter, laughter and clinking of glasses as endless assortments of wine, cider and cocktails are poured. The outrageous varieties of olives and the endless ways they are stuffed and partnered with anchovies and pimientos, as well as the visions of giant wheels of cheeses and dangling legs of jamón, combine to permeate all senses. As I sip my glass of rueda at El Mercado de San Miguel, I observe enthusiastic tourists photograph the fresh seafood on display, the already half empty paelleras and the assortment of tapas they have collected, like keepsakes, on their tables. As a British couple sample their slices of jamón and chorizo and let out a chorus of “Ooohs and Ahhhs”, I wonder, do they know how this bite-sized wonder of the world came to be? Historically, the tapa was served on the mouth of a pitcher or glass, accompanying the drink and serving as a cover for the vessel in order to prevent any flying visitors from invading the beverage. The word for cover or lid in Spanish is, in fact, tapa and this is how the snack came to be known. In those medieval days, the tapa consisted of a slice of jamón, sliced chorizo, or some other form of cured meat, though sometimes it was substituted for a wedge of cheese. The exact historical origin of the tapa can’t be precisely pinpointed, though there are numerous myths surrounding its inception. The most popular is that of King Alfonso X The Wise, the medieval King of Castile and León. It is said that he ordered wine to be served with a small portion of food in the taverns of his kingdom in order to keep the immediate effects of the alcohol at bay, or at the very least, to keep his subjects semi-sober and therefore, more productive. Oíd, Oíd (Hear ye, hear ye) the Tapa was born. Tapas have evolved considerably since then, today ranging from a dish of olives to a small serving of typical stew or paella, making it easy to substitute a round of tapas for a meal. However, never mistake the tapa with fast food. El tapeo is an important social tradition that generates friendship and camaraderie. Later, I spot two lovely old Spanish abuelitas enjoying an afternoon cortado and a caña de chocolate (a flaky pastry filled with chocolate)and I realize that the history of Spanish market days can be observed daily in las abuelas madrileñas. With their perfectly coiffed hair, flawless makeup, and delicate strand of pearls or neckerchief, these little ladies stroll the sidewalks with their shopping carts or cloth market bags. They are eager to chat; they will strike up a conversation with you in line at the supermarket or while you peruse produce in one of the neighborhood mercados and they are especially talkative with the market vendor that they’ve known for years. Some may even cut in line so, cuidado they are rápidas! Las abuelas reflect a time when ladies and gentlemen would dress their best to do the day’s shopping, as it was their moment to see their neighbors and, of course, court each other. To this day, madrileños love to look their best, stroll, and converse. But more importantly, they are very social citizens who have formed friendships with their neighbors and neighborhood market vendors. Mercado days in Madrid have evolved considerably over the years. Originating as open-air vendor stalls along streets and public plazas in the medieval days, they eventually developed into enclosed marketplaces in the late 1800s, due to sanitation issues in the city. Today, neighborhood mercado buildings are scattered throughout the city and during the weekend open air mercadillos open in the neighboring suburbs. A mercadillo consists of fresh produce, preserves, sweets, and clothing booths lined up in an open lot. 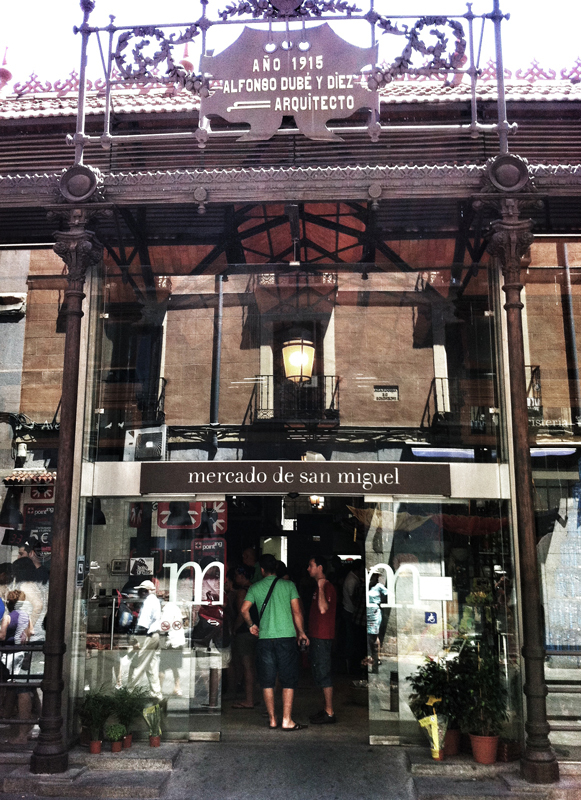 El Mercado de San Miguel sits in the center of Madrid, next to La Plaza Mayor. Remarkably elegant with its original iron structure from the early 19th century, San Miguel was one of the first enclosed markets to be built and it is the only one of such structures still standing. 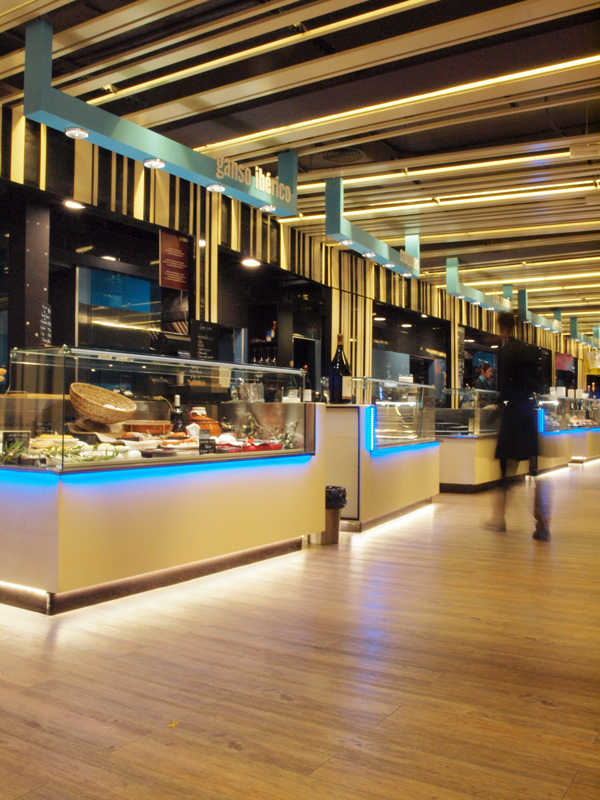 It is also the very first and internationally publicized gourmet mercado in Madrid. After a two-year renovation, the exquisite market opened its doors in 2009 as a gourmet tapeo bar of typical Spanish foods, though it tends to be more popular with tourists than with the locals. Nevertheless, its history, grand architectural details, first-rate food, and unique atmosphere combine to make San Miguel a special tapa experience. The three-storied Mercado San Antón is hidden away in the depths of the trendy barrio de Chueca, located down la calle de Augusto Figueroa, a street notorious for the fashionable shoe stores that line it on both sides. A modern design market boasting boutique-esque gourmet tapas and produce, San Antón, like San Miguel, is a market that has been a part of Madrid’s market history since the early 19th century. In 2007, the old market was demolished to recreate a new market to meet the demands of the modern barrio. In May of 2011 the new, green, energy-efficient market opened its doors to the community. Unlike San Miguel, however, San Antón still remains a market with booths that sell fresh fish, meats, cheeses, fresh baguettes, fruits, and vegetables on its ground floor. The second floor, however, supplies tapas, and on the ride up the escalators you can take a peek at the sky through the glass roof that provides natural lighting while listening to the life that percolates throughout the mercado. The tapa booths are comprised of Italian, Mediterranean, Japanese, and Spanish cuisine, Foie specialties and a vinoteca that serves up a fantastic rabo de toro. Amazing chocolate cake and Nespresso coffee can also be found on the second floor. On the buildng’s third floor, you can have a full course meal from the menu or the nice cut of the meat or fish you’ve purchased downstairs, prepared in the colorful restaurant La Cocina de San Antón. Follow up with coffee or a cocktail on the rooftop terrace while soaking in the neighborhood’s beautiful buildings and practicing some Spanish with the locals. Breaking through the original mercado mold is the vanguardist Isabela Gourmet Market. A four storied gallery of gourmet and design, Isabela, located in the financial district of Madrid, was inaugurated in April 2012. Created for the sole purpose of dégustation this gallery, as opposed to its predecessors San Miguel and San Antón, was never a traditional market. Instead, booths offering local and international cuisine line its black and teal interior. In addition, there is access to an outdoor bar and terrace from all floors. The first floor is the breakfast/merienda area where you can enjoy a slice of tortilla de patata from Spain’s tortilla de patata champion, have a pastry from the bakery, or order a coffee. Making your way to the second floor, you’ll find the nucleus of the Dégustation with ecologically produced Spanish cuisine offerings like a variety paellas served in personal-sized mini paella pans, fantastic ganso ibérico, tortilla de patata de ganso and jamón de ganso. Mexican, Peruvian, Japanese, Vegetarian and natural gelato are among the offerings. There is also a fully stocked vinoteca and a gin bar. The top floor houses the restaurant of internationally renowned chef Joaquin Felipe, where the diner is offered a peek into his crystal kitchen, located in the middle of the restaurant. If you’re visiting Madrid and are visiting the sites downtown, stepping into El Mercado de San Miguel any time of the day for a bite or sip of wine is a delightful taste of Spain, but if you visit Mercado San Antón and Isabela Gourmet Market any evening from Wednesday to Saturday, you get to experience Madrid. Photos by Jose G. Cabrera, Ignacio Prieto Leache and Jorge López Conde.